I start by placing flap hinges 100mm in from the spine and cheek with the third hinge exactly central. Some wide lids need four hinges; only on the smallest of instruments can two hinges be used safely. 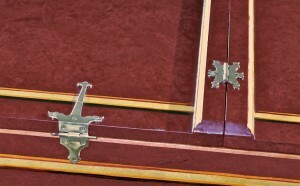 Likewise the main lid hinges need careful placement; the one nearest the lid break should not be too close or there appears to be a conflict with the flap hinge closest to it. I find 80mm -100mm a good starting point. The spine hinge nearest to the tail is placed much further in, the exact position depending on the length of the hinge and the width of the tail; the middle one is centrally placed. Fitting the small Keene & Brackley lock (Ref. 15) requires care. I wish I could get a smaller lock mechanism but this is the smallest proper brass one I can find. 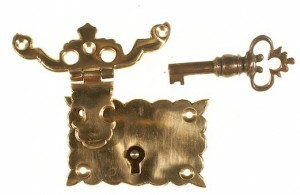 There is very little space since the batten into which the lock must fit is itself quite small. The other locks in the catalogue are all fitted in a broadly similar manner. The lock templates are for guidance only; castings vary in size and so does my assembly of the locks. Fit the hasp first, and use this to determine the position of the lock plate. For the others, fit the lock then lock the lid fitting onto it and close the lid to mark the underside of the lid.